← Who’s Reading “Providence Rag” Now? It’s Thriller Writer Ian Rankin! In my first novel, Rogue Island, one of the characters had a dozen autographed photos of Providence College basketball stars hanging on his office wall: Ernie DiGrigorio, Lenny Wilkins, John Thompson, and many more. A few weeks after the book came out, I got an email from John Egan asking why I’d left him out. Why indeed. Egan was a big star at Providence College. A second-team All American as a senior, he led the Friars to the NIT championship in 1961, back when that tournament decided the national championship. His 39 points against Villanova set the tournament’s single-game scoring record at that time. The 12th selection in the NBA draft that year, he went on to play 11 pro seasons with the Detroit Pistons, New York Knicks, Baltimore Bullets, Cleveland Cavaliers, San Diego/Houston Rockets and, most notably, the Los Angeles Lakers, where he started on a team that included Jerry West and Elgin Baylor. Later, he served as a coach of the Houston Rockets from 1973-76. I wrote John back, apologizing for the oversight and promising to mention him in every novel in my Mulligan series from then on. And so I have. 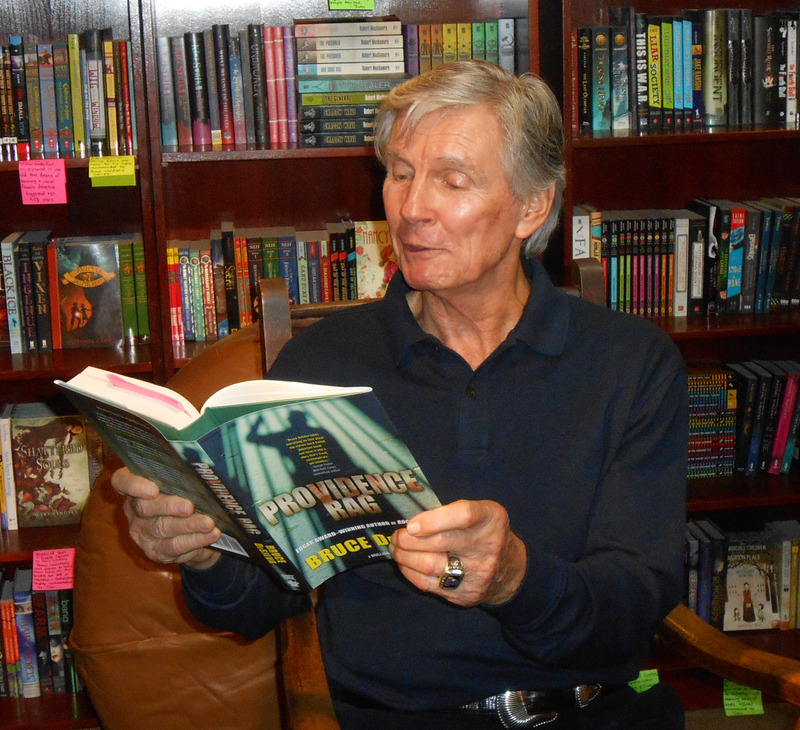 That was the start of a beautiful friendship, mostly carried on by email; but John has made a point of showing up for my book signings at Murder By The Book in Houston. That’s where I took the photo of him reading the book, just before we went to dinner. John also sent me this great photo of him attempting a reverse layup over my boyhood hero, Boston Celtics center Bill Russell. Russell was the best shot blocker of his day — probably the best ever–so I bet John that the shot was blocked. I lost. 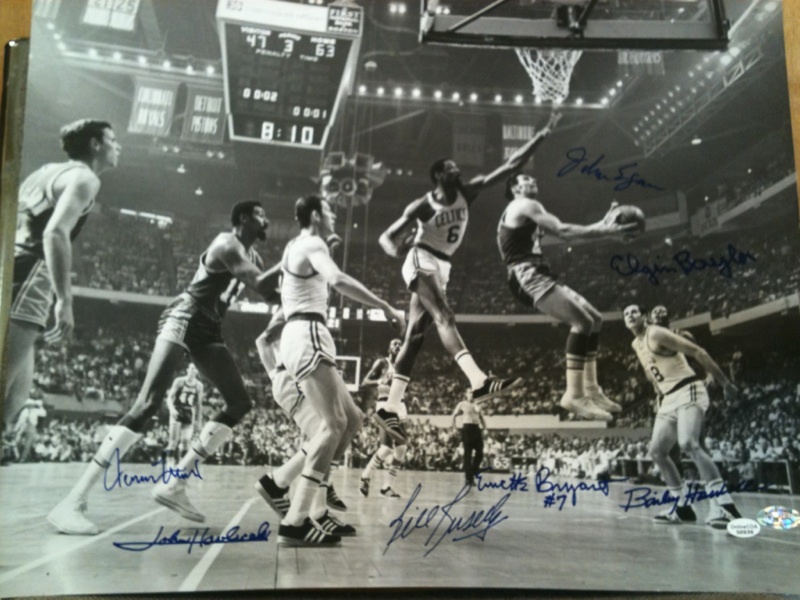 Other players who can be seen in the photo include Wilt Chamberlain, Bailey Howell, Emmett Bryant, and John Havlicek. This entry was posted in Uncategorized and tagged Bruce DeSilva, Cleveland Cavaliers, Elgin Baylor, Ernie DiGregorio, Houston Rockeets, Jerry West, John Egan, John Havlicek, John Thompson, Lenny Wilkins, Los Angeles Lakers, NBA, New York Knicks, Providence College, Providence Rag, Rogue Island, Villanlova, Wilt Chamberlain. Bookmark the permalink. John Egan, my best friend at P.C. put the college on the map!!!! People came to see him play. He was a truly amazing and exciting talent. Lenny Wilkins,was a superb defensive player, but people showed up, not to watch defense,, but to watch Egan’s offensive display. I’ve seen a lot of basketball. John was the best. PS I was his replacement on the PC Freshman team. Think I played much??????!!!!! !